Designed by architect George B. Post and completed in 1881, the Brooklyn Historical Society’s four-story building is in the U.S. National Register of Historic Places. A pair of eight-channel Ashly ne8250 amplifiers help to manage the AV in a new event space system.Designed by architect George B. 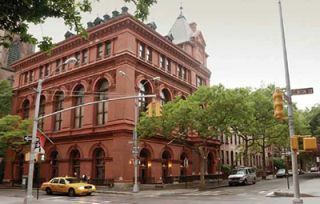 Post and completed in 1881, the Brooklyn Historical Society’s four-story building is in the U.S. National Register of Historic Places and is an example of living history in its own right. The society renovated the building a decade ago, and it continues to make improvements to ensure and enlarge its mission. Recently, it expanded the building’s event space to 200 seats and overhauled its AV system and that of an adjoining classroom and gallery space. Inputs to the system include a Blu-ray player, a DVD player, iPod docks, and XM Satellite Radio together with a bevy of sound reinforcement and wireless microphones. A 16-channel Soundcraft FX16 mixer on a rolling rack helps with live music events and the performing arts. A Peavey MediaMatrix NION N3 system handles all of the processing and routing. The stage floor monitor system featuring four JBL wedge floor monitors, dbx EQs, and a QSC RMX2400 amplifier provides crisp, clear sound to stage performers. A second rollaround rack with automated and manual mixers, and other facilities for tabletop conference style usage, allows setup of conference and lecture mics anywhere. A Listen Technologies assisted listening system exceeds ADA requirements. At the heart of the video system is a Crestron Digital Media DM-MD8x8 video matrix processor, two video projectors, and various flat screens. Crestron DM input panels provide auto switching between HDMI and VGA/PC.